When you invest in something (time, money, energy) you generally get better (or more predictable) results than if you don’t invest, or leave things to chance. While there are many examples of this in life, here’s the situation that inspired this post. When I travel, I normally get a rental car. I like the convenience and flexibility it provides, but it’s not always practical. That was the case last week when I traveled to West Palm Beach for the Florida Attractions Association conference. (More insights from the conference to come). During my 4 days at this particular conference, I didn’t need to go anywhere outside of the hotel, and therefore didn’t want to spend the money on valet parking since the car would just be sitting there for 4 days. So, my transportation to and from the hotel would be the shuttle provided by the hotel. After picking up my luggage at baggage claim, I went to the meeting spot where all hotel shuttles were to meet their passengers. I saw shuttles from other hotels and car rental services go by, but not mine. So I waited. While I thought I had read that the shuttle ran on a regular schedule, it occurred to me that maybe that wasn’t about THIS hotel shuttle. Hmmm…. maybe I should go ahead and call? As I waited, this is when the concept of investment ran through my brain. Had I spent the money on a rental car or even a cab, I would likely be at the hotel by now. Instead, I am at the mercy of someone else’s schedule. Once the shuttle arrived, I was told we had to pick someone else up at the executive airport nearby. After we got there, we found out that the person to be picked up was at the regular airport after all, so back there we go, all before heading to the hotel itself. Before we go any further, this is not a complaint about the hotel shuttle service, or the fact that I had to wait. The driver was actually very pleasant and the van was well appointed and clean. This is actually just an observation of the results we get when we invest in something versus when we don’t. It’s very much like that quote that makes the rounds every few years. You know the one…. I think this investment argument works with employees, relationships, hobbies, projects, you name it. The more you put in, the more you get out. Many companies put a lot of emphasis on training new hires. Great – there is a lot they need to know. But, how many of those companies INVEST in season-long learning strategies? I don’t have any official data to share on that, but from the people I talk to, the number is quite low. Part of the problem is when we look at our seasonal staff as temporary. Sure they will only be on payroll for a few months, but that doesn’t mean they can’t be trained and developed so they can help the company be successful for years to come. The experience of being groomed for the next level could be the difference between someone coming back for another season or you having one more spot to fill. Of course the other option is to do your training up front and hope for the best the rest of the season. It’s your choice. In all of this, there is a fundamental understanding that “investing” is different than “spending”. Spending implies a commodity transaction with little or no long-term return on that spend. Investing assumes there will be a calculated output in proportion to your input. Both can refer to money, time, resources, etc. 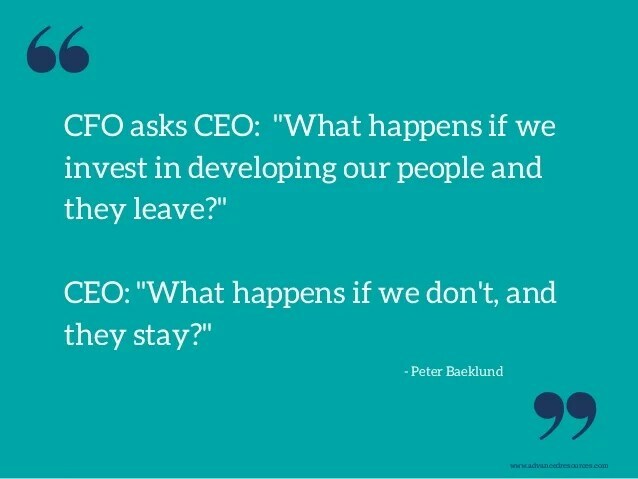 If we look at the quote above, maybe the CFO is thinking that it’s a waste to spend the money developing people… there will be no appreciable return in his mind. Maybe the problem is that he doesn’t really know what that return would actually look like. For me, I’ve seen the results when we invest in our people. They are more confident, engaged, motivated, and willing to help out when the chips are down. And while it could take an investment of money to make this happen (in the form of additional development resources, not just a wage increase) it’s also our investment of time. Time to communicate, to coach, to listen, and to set the example of how you want your team to behave. So if you would like more predictable excellence, investing in your team definitely IS worth it! About the author – After 20+ years in hospitality leadership and human resources, Matt Heller founded Performance Optimist Consulting in 2011 with one simple goal: Help Leaders Lead. Matt now works with attractions large and small and leaders at all levels to help them improve leadership competencies, customer service, employee motivation and teamwork. His book, “The Myth of Employee Burnout” was released in 2013 and has become a go-to resource among industry leaders. If you follow me on Facebook, you know that my wife and I just came back from our first ever trip to Europe. We took a pizza making class in Naples, a food tasting tour in Trastevere (Rome), and a cooking class in Lucca. We also did the Painted Wall self guided walking tour in Cannes and rode a Ferris Wheel (big surprise) in Marseille, France. You probably noticed that the majority of our activities centered around food! While we of course wanted to try the local delicacies, we also wanted to get more of a glimpse of the local culture and people – and we got that. What we also got, without even trying, was an education in engagement. If my trip to Europe reinforced anything, it’s that EVERYTHING matters. Was the food good in Italy? No. It was AMAZING! But I would dare say that as good as it was in reality, it tasted EVEN BETTER considering the environment. For example, during our cooking class in Lucca, we were not only learning from a world renowned chef, but we were also sharing the experience with people from the Netherlands, Scotland, England and Seattle – people we had just met that day. Sitting around a huge table on a farm in rural Italy, eating a meal that you helped prepare, engrossed in engaging conversation… how could the food NOT taste good? And that’s why I think people (including us) come back from vacation with stories of the best this or the best that. The environment heightens the experience and makes everything better. Since this is not a food or travel blog, this has to tie back to engagement soon, right? You have heard me say time and time again that engagement is about the environment that we create for our employees. That while recognition is important, on it’s own it can’t fully engage someone in their work. It’s about the hiring, training, discipline and yes, termination that will begin to create an engaging environment. But you know what? That’s not everything either. It’s about the look of the room when new hires come in for orientation or to do their paperwork. It’s about how well the real world (their work location) matches up with what they are told in training or when they were recruited. It’s about how much pride YOU take in the company and how you treat the guests that will carry over to your employees. When we were on our food tour, our guide Francesco warmly greeted every shop owner we encountered. He would say, look at this beautiful man or family or woman. He didn’t mean beautiful in terms of looks, but beautiful in terms of the people they are. When referred to that way, each an every person smiled and beamed and showed their true beauty. Does that make you beam with pride? Didn’t think so, but that’s part of the environment, too. So here is your challenge – especially as some of you are beginning daily operation and ramping up for summer crowds… analyze EVERYTHING that could make an impression on your employees. Again, you have heard me talk about the importance of communication, recognition and listening. Those are a great starting point. But also look at the physical environment, how employees are moved through your processes (hiring, training, cross utilization). What do your break areas look like? Are you taking care of “behind the scenes” areas as much as guest facing areas? Employees see those areas before and after their shift… so they are the first and last impression they have. Do your employees go through a security check point? How is that experience? Is the person at that post starting the day off on a positive or negative note? Do you have company logos, mantras and insignias posted around your offices and buildings to remind and inspire your staff? How do they look? Are they up to date or ripped and falling apart? When an employee has to interact with someone from another department, how does that go? What example are full time staff setting for front line staff when out in park? And the list could literally go on and on… but for this post, we’ll stop here. Part of this challenge is to put yourself in the shoes (and mindset) of your employees. You may know why something is not working and may even know when it’s going to be fixed, but a new hire doesn’t know that, and will assume that that’s just the way it is and no one cares about it. Fast forward two months from now, when all of these influences have piled up and created a lasting impression of you and the company. One little thing might not be a big deal, but put it all together and it tells quite a story. You are the author of that story and can determine how it ends. That is, if you remember that EVERYTHING matters. About the author: While it was not Matt’s original intent, the theme of this post fits nicely with the theme of this years’ IAAPA Attractions Expo, which is Every Experience Matters. Of course, that’s in November. Next week is the Florida Attractions Association conference, where the theme is Mission: Possible – Creating The Adventure. Our mission as leaders is to create a positive adventure for our teams, and if we focus on the right things, that mission is POSSIBLE!! If you are coming to the FAA Conference, Matt will be speaking on “Investigating Workplace Conflict” on Tuesday, June 14 at 10:30 am.